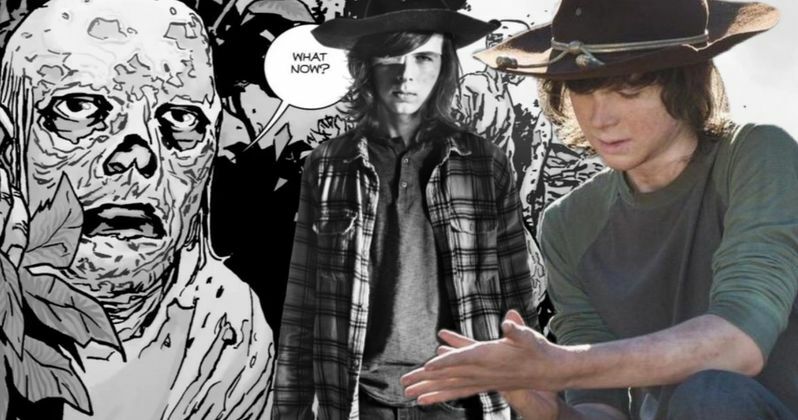 Known for playing Carl Grimes during the first eight seasons of The Walking Dead, Chandler Riggs has accepted the character's death and moved on with his career. Still, the actor can't help but feel some regret over missing out on the adaptation of some major storylines from the comics on the TV series. This includes the current ordeal between the survivors and the Whisperers, a vicious group of baddies wearing zombie flesh over their own as camouflage. Although the comic book version of Carl was able to deal with the Whisperers personally, TV Carl was long dead by the time they were introduced, and Riggs told fans at Walker Stalker Cruise 2019. "I mean, yeah, I was looking forward to a lot of the storylines, specifically with Lydia because it was just such a unique storyline for Carl and it meant so much to the storyline," Chandler Riggs admitted. "But I'm on ABC now, so it's all good," the actor goes on to add, referring to his new gig on the upcoming series A Million Little Things. It's clear the actor has embraced his character's exit by still taking part in fan events such as the Walker Stalker Cruise. Although he'll always be Carl Grimes to longtime fans of The Walking Dead, he's also now just a regular fan along with the rest of us, and now gets to watch the series not knowing what's going to happen from week to week. Carl's demise came in the middle of Season 9, when the character was helping a stranger named Siddiq (Avi Nash) back to Alexandria. Because Siddiq's mother believed killing the walkers freed the human souls trapped inside, the survivor had been exterminating each zombie he came across. While helping Siddiq dispatch more walkers, Carl was bitten on the torso. He managed to return to Alexandria and save the residents of the town by tricking Negan and the Saviors. Rick and Michonne then returned just in time to witness Carl's passing, which was one of the most gutting moments of the series. Riggs isn't the only major casualty to depart The Walking Dead over the past year. Rick Grimes was written out of the series following the announcement that Andrew Lincoln was departing the show in Season 9. Although he was definitively written out in the early episodes of the season, Lincoln will reprise the role for three Walking Dead TV movies to conclude Rick's storyline. Lauren Cohan's Maggie Greene-Rhee was also written out of the series after her casting on the new series Whiskey Cavalier, although she could potentially return in the future. Michonne is also now reportedly on the chopping block as well, as it's been reported Danai Gurira is also set to leave the series. Still, despite the exits of so many important characters, The Walking Dead is faring very well critically. Its current season is the highest-rated on Rotten Tomatoes, so even if less people overall are watching, those who are seem to really be enjoying it. For Riggs and many longtime fans of the series, however, it's still hard not to wonder how Carl, Rick, and other characters who've since left would handle the Whisperers on the TV series. This information comes to us from ComicBook.com.